This post continues my series on a “shadow bra industry” in which individual women are working behind the scenes to fit and sell bras outside of brick and mortar or online outlets. Direct sales is one business model that gives women the ability to offer a lot of sizes without the risk of carrying inventory. In my last post on the subject, I introduced you to a new company called Peach, and today I’m introducing you to Essential Body Wear, a company that has been in business since 2003. If you’re looking for someone you can trust to fit your friends, or if you’re trying to find an affordable way to do it yourself, then I highly recommend researching Essential Body Wear. After a telephone interview with the company’s CEO Carrie Charlick, I trekked out to Staten Island one Saturday morning to meet the only Essential Body Wear rep in the area, Tina Murphy. Tina is VERY good at meeting that need. Instantly likeable, Tina carries a bra in every size and is candid about the pros and cons of each style. I knew I could trust her when she told me that she prefers her Panache sports bra over EBW’s. 1. Do you like their bras? It reminds me of my old standby, the Fantasie 4520, except that it also comes in pretty colors like raspberry, toffee and plum. I purchased this bra from Tina at a discount. I’ve worn it several times over the last two weeks and am completely happy with it. The band is super tight (more on that in #3 below), it tacks at the center gore, my breast tissue is contained, and I barely give it a second thought throughout the day (but see #3 below for what causes the occasional second thought). Even better, my super picky friend who joined me on Staten Island told me that this is one of the few bras for C-H cups that she felt she could believe in enough to sell. 2. Does Essential Body Wear offer enough sizes? Essential Body Wear offers 32A to 44H, enough of the core sizes to meet many women’s needs. However, keep in mind that there are no double letters. Unfortunately, the EBW contract doesn’t allow its reps to sell anything other than EBW (to avoid brand confusion), so an EBW rep must have someone trustworthy to whom she can refer any woman who can’t legitimately sister size into an H cup. This means that for most of my friends who ask, “Where should I go for a bra fitting?”, EBW is a great answer if there’s a rep that I like in the area. But for friends that might wear a British H+, I’ll have to keep looking. 3. What is the fitting process like? Next, she asked, “Do you like wire or non-wired?” If a woman is bustier, she will try to talk her into a wired bra unless there is a medical issue. Finally, each EBW rep owns a set of of molded Abbie cups that she can place over a client’s (clothed) breast to help determine cup size. Tina doesn’t tend to use these anymore because she’s become good at estimating, but I thought they looked neat so she obliged me by choosing one that covered my largest breast and anchored firmly against my sternum at the center. In this starter kit for new Essential Body Wear reps, the arrow points to the stack of cups for fitting. These steps gave us a starting point. 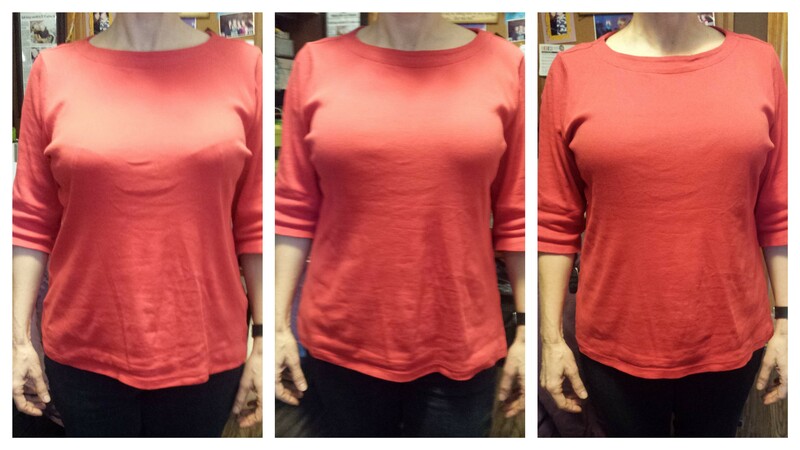 My rib cage measured 31″ and the F cup fit over my left breast, so Tina suggested I begin with a 34F. The band felt fine, but the cups were too small. The 34G fit well, but of course I wanted to try a 32. They are not kidding when they say their bands run tight! In the end, I liked the fit and look of the 32H with an extender (without it I had slight pillowing). Because the straps are at the far sides of the cups, Tina was afraid that an extender would cause them to slip off my shoulder. I pooh-poohed her fears and assured her that I never have a problem with slipping shoulder straps–and I didn’t when I only needed one extra column, but when I use a second extra column (because their bands run really tight! ), the left strap feels less secure. Tina herself wears a 36H in Abbie, but she also swears by EBW’s strapless 5-way convertible Chrissy that she can wear in 36F. My friend wears a 34I in Kris Line but also fit the 36H in Abbie. She said she liked it a lot and that it felt secure and looked okay even though she’d had to sister size. Meeting Tina and wearing the Abbie almost makes me want to go into bra fitting! If I did, I would pay $99 to be an apprentice for a month, which would entitle me to a free bra and the rest of the starter kit. I would shadow a senior rep as she leads two parties, and the senior rep would shadow me as I lead two parties on my own (it’s possible to sell outside of parties–Tina often has customers drop by her in-home bra fitting studio during the day). Once the month is up, it would be decision time: (a) say no thank you, (b) purchase the Basic Kit to Fit for $649 that includes a set of Abbie bras in C-G cups, or (c) purchase the Ultimate Kit to Fit for $999 that includes the Abbie in every size. I like EBW’s product, and I respect their organic growth. I’m still committed to shirt fitting, but maybe my friend will become the EBW rep that I can refer my non-Staten Island friends to! I’d be happy to speak with you and possibility meet with you for an EBW fitting. Our bands are super tight, so there is a sure possibility our sister sizing can work for you. I have provided my email address, lets have an uplifting conversation!